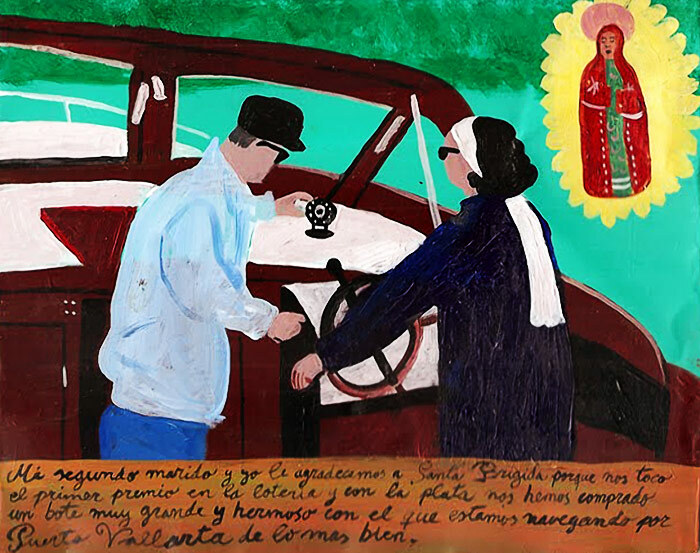 The worker Artemio Lopez brings the present retablo to Saint Nicholas thanking him for winning the Volkswagen factory’s lottery and getting a new car. 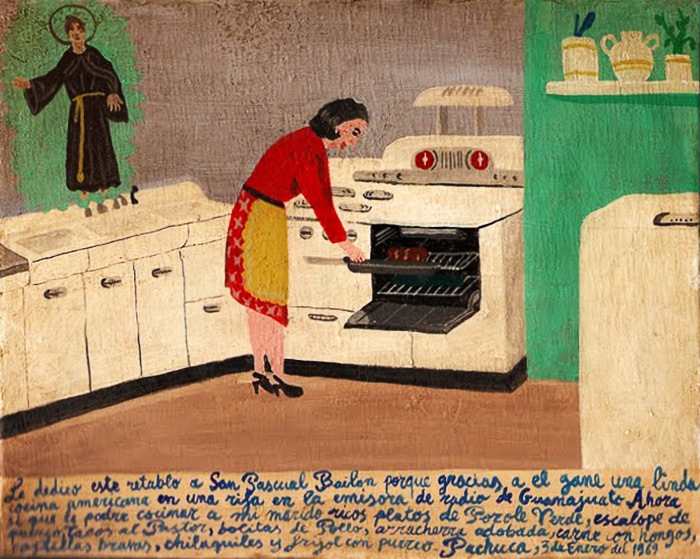 I dedicate this retablo to Saint Paschal Baylon because we won a nice American kitchen in a Guanajuato’s radio program raffle. Now I can cook delicious dishes for my husband—green pozole, pork escalopes, tacos al pastor, chicken balls, marinated arrachera steak, meat with mushrooms, grilled ribs, chilaquiles and pork with beens. 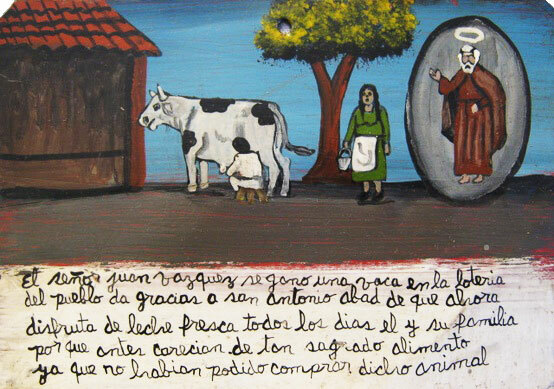 I thank the Virgin of San Juan because my children won a calf in the church lottery. 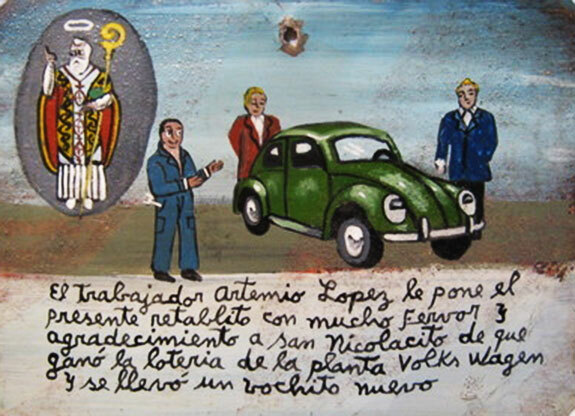 I dedicate this humble retablo to Saint Patrick for having won the lottery. I bought a ticket and won a jackpot. 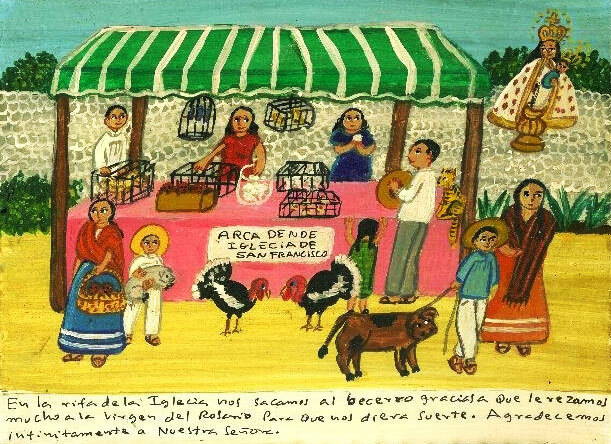 When I was poor no woman wanted even to talk with me cause I was ugly. But now when I’m a millionaire, the most beautiful women looking for me. I can go out with everyone I want, and they see me as a handsome guy. We won the calf at the church lotery thanks to our prayers to the Virgin of the Rosary to give us some luck. We infinitely thank the Holy Virgin. 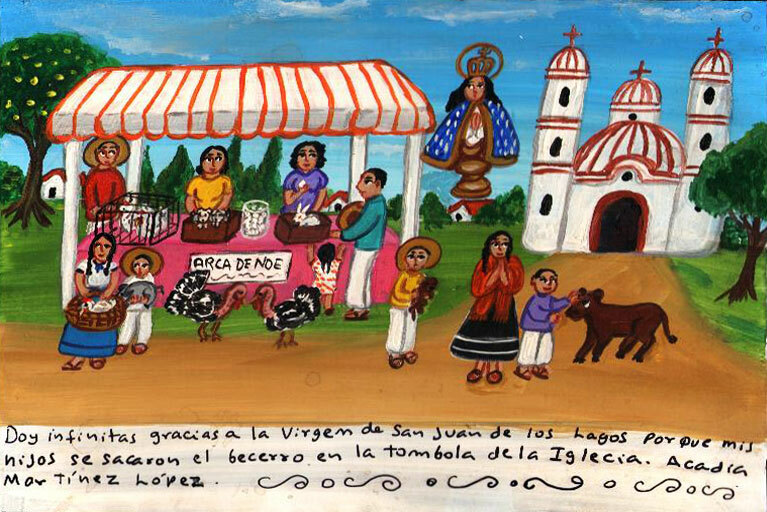 I thank my Virgin of Toluca because not a long time ago I was unhappy working in a bank with a very small salary. But then I won the lottery, and now I’m having a real blast with my chicks. And I go in the bank every day to take more money. 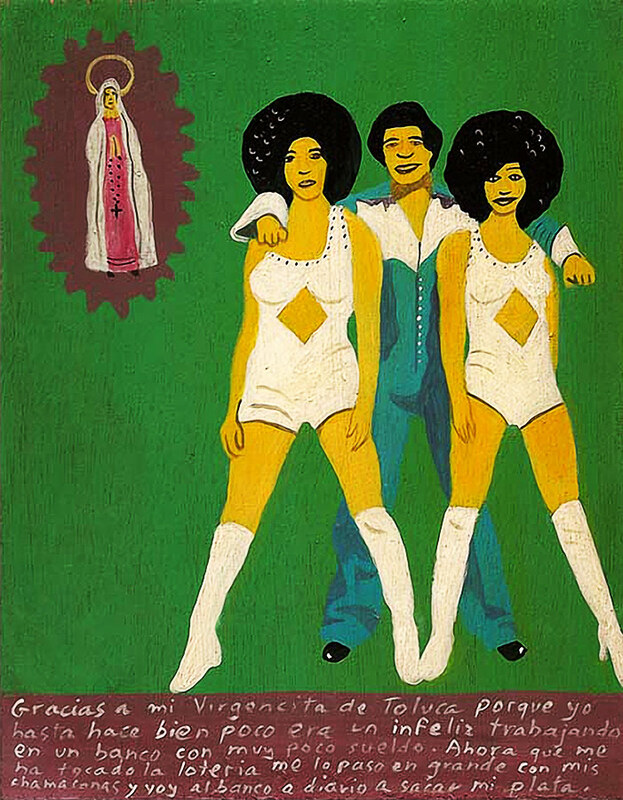 Virgin of Guadalupe, I thank you for giving me luck to win a trip to Cancun in the union raffle. Сеньор Хуан Васкес выиграл корову в городской лотерее. Он благодарит Святого Антония Великого, поскольку теперь он и вся его семья каждый день наслаждаются свежим молоком. Прежде им недоставало столь священного продукта, так как они не могли позволить себе купить скотину. My second husband and I thank Saint Brigit because we won the first prize in the lottery. With the money we bought a very big and beautiful boat on which we are sailing to Puerto Vallarta. My father didn’t like my boyfriend because he was a dirty rocker. 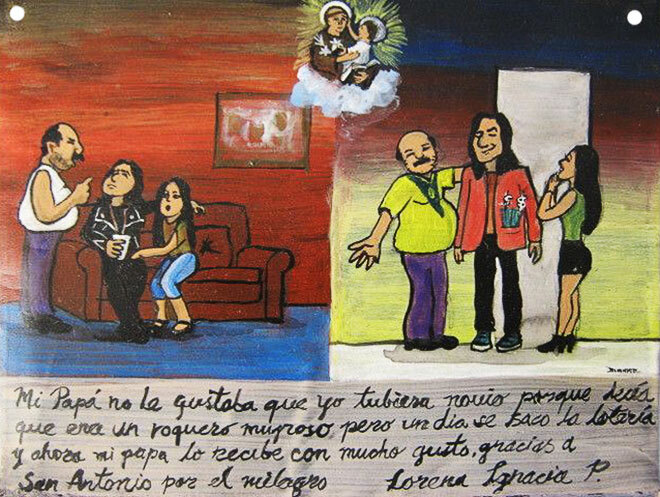 But one day my boyfriend won the lottery, and now my dad always receives him with great pleasure. I thank St. Anthony for this miracle. 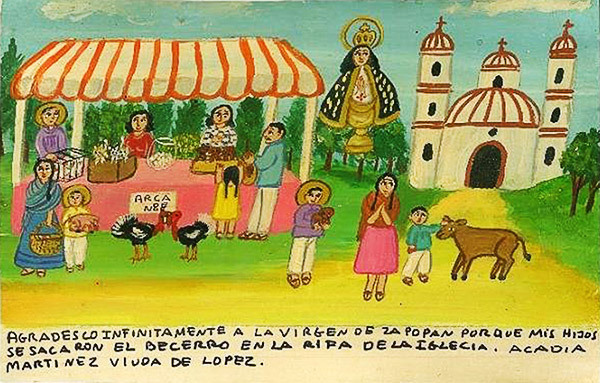 I thank Virgin of Zapopan because my children won a calf at church raffle.